Being the young whippersnapper I am, I never played the original Final Fantasy for the NES back when it first came out (I wasn’t even born at that time. Take that, old fogies!). Nevertheless, the Final Fantasy series holds a special place in my heart; Final Fantasy IV Advance was my first non-Pokémon JRPG. As a result, I was very excited, upon receiving my PSP for Christmas a non-specific festive holiday some years ago, to be able to play the game that launched the series. 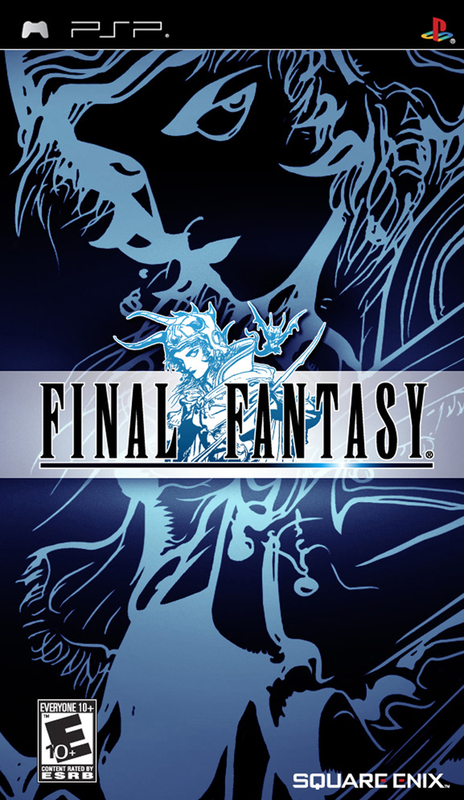 I never got too far in Final Fantasy Anniversary Edition back then, but I recently went back to it, and enjoyed it enough to finish the game for the first time. Final Fantasy is the archetypical JRPG; four young heroes with mysterious pasts are tasked with restoring the four elemental crystals, defeating a devious villain, and saving the world. The game drops you right into the adventure, too. 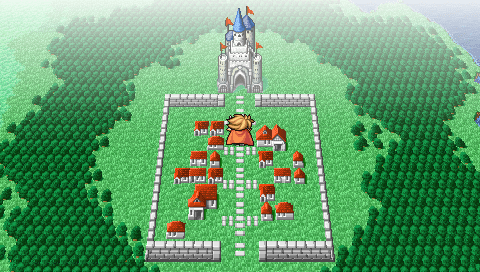 After creating your four “Heroes of Light,” giving them names, and choosing from one of six classes (Warrior, monk, thief, white mage, black mage, and red mage) for each, you’ll find yourself plopped down in front of the city of Cornelia. You pretty much have to figure out what to do from there. Unlike most modern games, you generally have to pay attention to Final Fantasy’s (minimal) narrative and incidental dialogue from NPCs if you don’t want to wander aimlessly for hours (like I did at least once). Sooo… I just started the game… Now what? Now, it has to be said that this is a remake of the original Final Fantasy, and I would be remiss if I didn’t make note of what’s been changed. Just to get this out of the way, I have played the original Final Fantasy… For all of five minutes on the Wii Virtual Console, so I don’t have a great frame of reference here. The graphics and sound are obviously improved, and I know that there were new dungeons added. The best game-play change I noted was the fact that attacks directed at slain foes no longer result in hitting mid-air, instead being redirected toward an active enemy. I suspect the difficulty level was also lowered, which is nice, because from what I played, the original was brutal. The random encounter rate is still very high, but I didn’t find this to be a big deal, as I found the grinding somewhat cathartic. Final Fantasy Anniversary Edition also includes a few other extras; a bestiary that lets you view the stats of all the game’s enemies after you meet them. (Good for completionists), an art gallery of Yoshitaka Amano’s concept art (these also have to be unlocked), and the CG cutscene from the Playstation release, Final Fantasy Origins. It’s not a lot, but it’s nice for series fans and completionists. Head on over to Page 2 for a breakdown of the game! Devin is a Canadian, and as such, plays hockey (no he doesn’t) and drinks maple syrup (not really) while riding a wild moose (he’s never seen a moose). When he’s not perpetuating cultural stereotypes, he’s playing videogames, which has been, on occasion, very bad for his mental health, problems with which have plagued him for years. Now, at 20, he’s getting his mental health issues under control, and he’s trying to decide what to do with his life. He’s currently debating between journalism and trying his hand at the dramatic arts.